Do you ever get a MAJOR craving for fried rice? Like, that sticky, delicious, greasy fried rice from the always-open Chinese place down the street? I get this craving all the time. But my body (and wallet!) doesn't seem to like this craving. 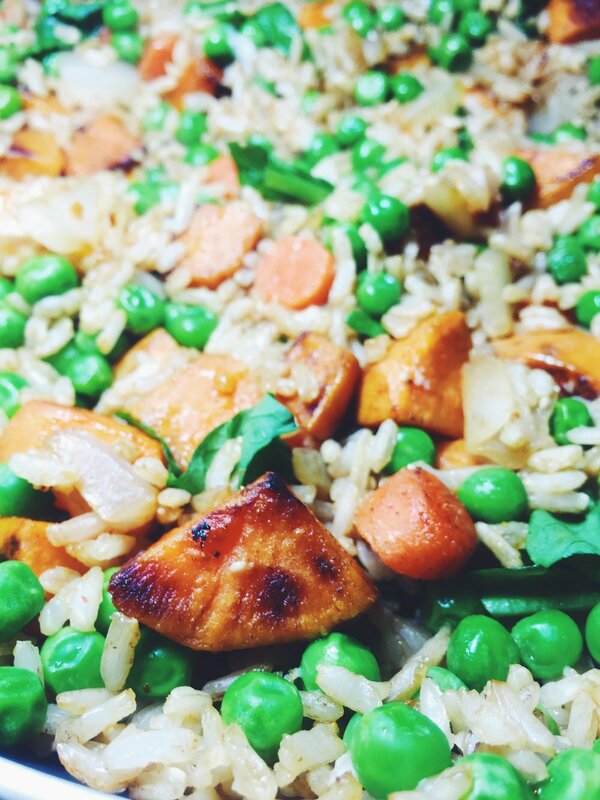 Enter this healthy brown-rice-pea-and-sweet-potato meal. Seriously, it's so good and reheats really well for lunches throughout the week. I've eaten it three times now and it's STILL tasty. And it's all good for you! 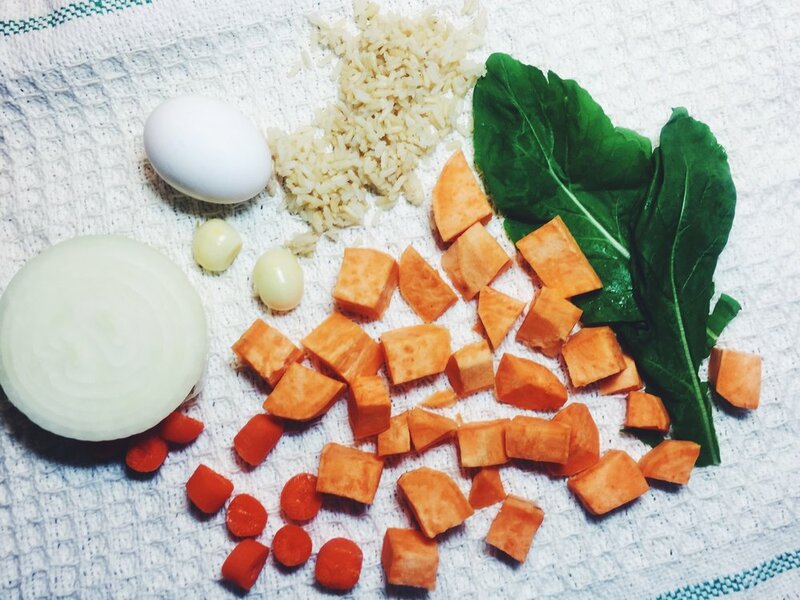 Brown rice (in appropriate portions), sweet potato (a superfood! ), carrot, leafy greens... what isn't there to love!? The secret to getting that perfect texture? Cooking the rice early. Like, it needs at least 2 hours to just chill out in the fridge and get all perfectly sticky. You CAN skip this step, but you won't want to. 2. in a large skillet, heat 1 tsp oil over medium heat. add sweet potato and water and stir-fry, stirring often. add more water as needed (but not much!) cook until potato is fully tender and browning on both sides. 3. add onion and carrot and cook until onion is translucent, about 3 more minutes. add 5-spice powder and garlic and stir to coat, then remove vegetables from the pan. 4. in a small bowl, mix together soy sauce, rice vinegar, and sriracha. heat your (empty) pan back up with the rest of the oil, stir fry the rice for 3-5 minutes, then drizzle sauce over the rice. mix well and add in those veggies (including peas this time!). stir in a scrambled egg and let it cook while you stir everything (THIS IS OPTIONAL!). fold in the greens at the very end. serve immediately! 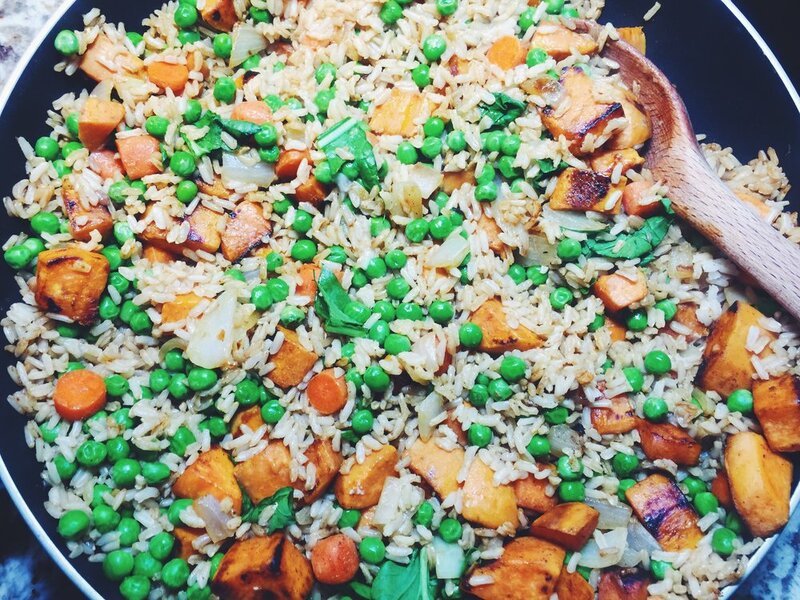 PS this is really yummy for leftovers (just like normal fried rice is!). This recipe is adapted from the Thug Kitchen cookbook.